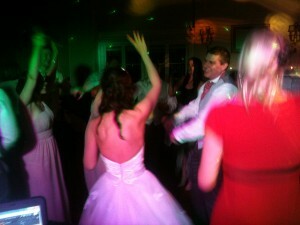 3rd August ’12 – Been involved with 2 wedding parties at Croxteth Hall, Liverpool just lately. The first was the wedding of Mr & Mrs Rose on Friday the 3rd. They had hired me to DJ for their evening reception. First time I’ve played at Croxteth Hall, nice place for a wedding, actually an Edwardian Country House where the Earls of Sefton resided. Their first dance was performed to Elton John ‘Your Song’. They had also asked for a selection of oldies & current chart/pop music. Although they hadn’t asked for it, possibly the biggest dance floor filler of the night was Journey ‘Don’t stop Believin’! We had a massive finale which wrapped up with Jay Z & Alicia Keyes ‘Empire State of Mind’ (as that’s where they were jetting off to enjoy the honeymoon). All the best to Christina & Andy! So, if you are looking for an experienced wedding DJ who knows Croxteth Hall, email your enquiry to andy@andybevents.co.uk As a guide, our prices in Liverpool (excluding the city centre) start from £250 which covers playing times of 7.30pm till midnight (arriving at approx 6.15pm to set up). For any extra time, add £30 per hour.